We’ve been fans of SkinnyCorp for several years now. We saw their founders on a panel at South by Southwest in 2006, and they wowed us with their corporate philosophy. We were already fans of the funky t-shirts they sell at Threadless (the punny “communist party” and “hypotamoose” t-shirts are in heavy rotation in the PodcastMama shirt drawer). Plus they have a regular podcast, which always wins brownie points from us. But last month, when looking through their weekly shirt flyer, we clicked on a link that took us to the coolest. podcast. recording. rig. ever. “When we first moved into the office, we started building a studio, then we came to the conclusion that we should buy something mobile in case we wanted to take it to the road. What we have here in the pictures is a 1962 Airstream Bambi. We picked it up in Minnesota off eBay. Once we brought it home (to Chicago) we gutted it out, and built it all out ourselves, and equipped it with some awesome technology. Every week we do a podcast in here, and let people know what is going on in the office and what is going on in the warehouse. This is one of the coolest recording setups we’ve ever seen. Perhaps you’ve seen (or possess) better? We’d love to know about it! That’s a sweet ride. I wonder how they handle AC/keeping stuff cool. Our studio becomes an oven after three hours of show. 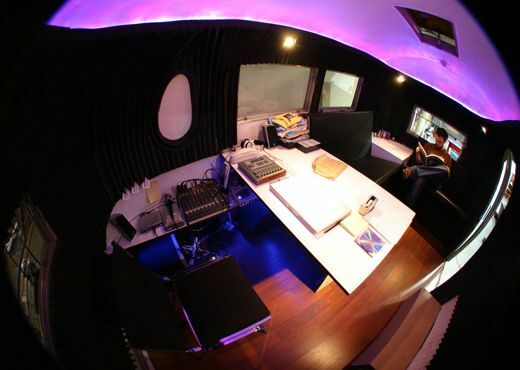 That’s one hella portable studio. That’s a fan-friggin-tastic idea. 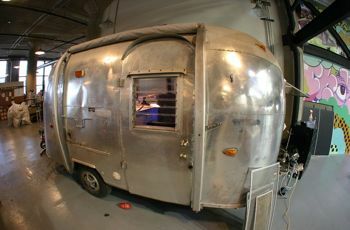 I would be hard pressed to make my Airstream style camper into a studio!!! A bar maybe…. But a studio? Nice work though! This is an amazing testament to the owner’s tenacity and devotion to podcasting. I absolutely love it! I’ve been talking to the OH about travelling and taking our podcasting business along. I didn’t truly believe a podcasting studio in a campervan would be feasible. This has totally changed my gameplan for the better.